FLORENCE – Rewind to the late 1990s. After an eight-decade-long hiatus, the global economy was being reunified. Economic openness was the order of the day. Finance was being liberalized. The nascent Internet would soon give everyone on the planet equal access to information. To manage ever-growing interdependence, new international institutions were developed. The World Trade Organization was brought to life. A binding climate agreement, the Kyoto Protocol, had just been finalized. The message was clear: globalization was not just about liberalizing flows of goods, services and capital but about establishing the rules and institutions required to steer markets, foster cooperation, and deliver global public goods. Now fast-forward to 2018. Despite a decade of talks, the global trade negotiations launched in 2001 have gotten nowhere. The Internet has become fragmented and could break up further. Financial regionalism is on the rise. The global effort to combat climate change rests on a collection of non-binding agreements, from which the United States has withdrawn. 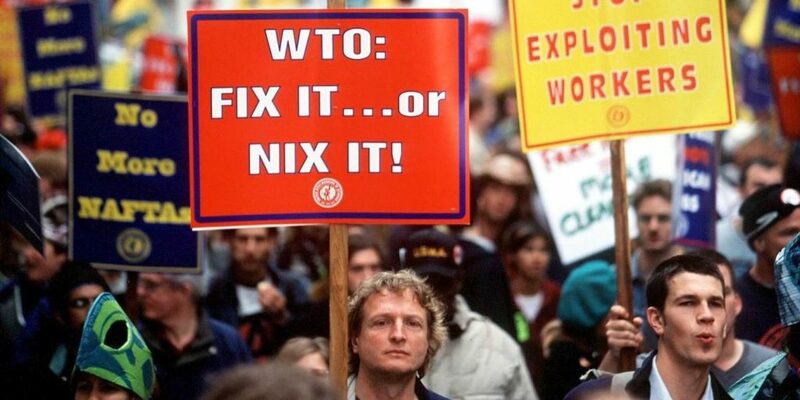 Yes, the WTO is still there, but it is increasingly ineffective. US President Donald Trump, who does not hide his contempt for multilateral rules, is attempting to block its dispute settlement system. The United States pretends against all evidence that imports of BMWs are a threat to national security. China is brutally ordered – outside any multilateral framework – to import more, export less, cut subsidies, refrain from purchasing US tech companies, and respect intellectual property rights. The very principles of multilateralism, a key pillar of global governance, seem to have become a relic from a distant past. What happened? Trump, for sure. The 45th US president campaigned for the job like a bull in a china shop, vowing to destroy the edifice of international order built and maintained by all of his predecessors since Franklin Roosevelt. Since taking office, he has been true to his word, withdrawing from one international agreement after another and imposing import tariffs on friends and adversaries alike. Still, let’s face it: today’s problems did not start with Trump. It was not Trump who, in 2009, killed the Copenhagen negotiation on a climate agreement. It was not Trump who is to blame for the failure of the Doha trade round. It was not Trump who told Asia to secede from the global financial safety net managed by the International Monetary Fund. Before Trump, problems were dealt with more politely. But they were there. There is no shortage of explanations. An important one is that many participants in the international system are having second thoughts about globalization. A widespread perception in advanced countries is that the rents from technological innovation are being eroded precipitously. The US factory worker of yesterday owed his standard of living to these rents. But as the economist Richard Baldwin brilliantly shows in The Great Convergence, technology has become more accessible, production processes have been segmented, and many of the rents have gone. A second explanation is that the US strategy toward Russia and China has failed. In the 1990s, Presidents George H.W. Bush and Bill Clinton thought that the international order would help transform Russia and China into “market democracies.” But neither Russia nor China has converged politically. China is converging in terms of GDP and sophistication, but its economic system remains apart. As Mark Wu of Harvard argued in a 2016 paper, although market forces play a strong role in its economy, coordination by the state (and control by the Communist Party) remains pervasive. China has invented its own economic rules. Finally, global rules look increasingly outdated. Whereas some of their underlying principles – starting with the simple idea that issues are addressed multilaterally rather than bilaterally – are as strong as ever, others were conceived for a world that no longer exists. Established trade negotiation practices make little sense in a world of global value chains and sophisticated services. And categorizing countries by their development level is losing its usefulness, given that some of them combine first-class global companies and pockets of economic backwardness. But inertia is considerable, if only because consensus is required to change the rules. So what should be done? One option is to preserve the existing order to the greatest extent possible. This was the approach adopted after Trump withdrew the US from the Paris climate agreement: the other signatories continue to abide by it. The advantages of this approach are that it contains the damage from one country’s peculiar behavior. But, to the extent that the US attitude is a symptom, the conservationist approach does not address the disease. A second option is to use the crisis as an opportunity for reform. The EU, China, and a few others – including, one hopes, the US at some point – should be the ones to take the initiative, salvaging those aspects of the old multilateralism that remain useful, but fusing them into new arrangements that are fairer, more flexible, and more appropriate for today’s world. This strategy would have the advantage of identifying and absorbing the lessons offered by the exhaustion of traditional arrangements and the emergence of new ones. But is there enough leadership and enough political will to go beyond empty, face-saving compromises? The downside risk is that failed reform could lead to a complete unraveling of the global system. In the end, the solution is neither to cultivate the nostalgia of yesterday’s order nor to place hope in loose, ineffective forms of international cooperation. International collective action requires rules, because flexibility and goodwill alone cannot tackle hard problems. The narrow path ahead is to determine, on a case-by-case basis, the minimum requirements of effective collective action, and to forge agreement on reforms that fulfill these conditions. For those who believe that such a path exists, there is no time to lose in finding it.